As schools and corporations continue to streamline mobile devices into their training curriculum, Applied Computer Systems, Inc. (ACS) continues to help instructors manage and remotely access their trainee devices, including iPad and Android tablets. ACS’s SoftLINK software enables instructors to view the trainee Android tablets from the instructor’s Window’s desktop or Android tablet. SoftLINK’s impressive and user-friendly interface helps speed the flow of communication and interaction between instructors and trainees. SoftLINK’s mobile device management features are instructors’ top choice when needing to manage and maintain their trainees’ attention. No longer do instructors need to remain at their desk to give a presentation or conduct a survey. SoftLINK allows the instructor to walk freely throughout the room and engage with the class. 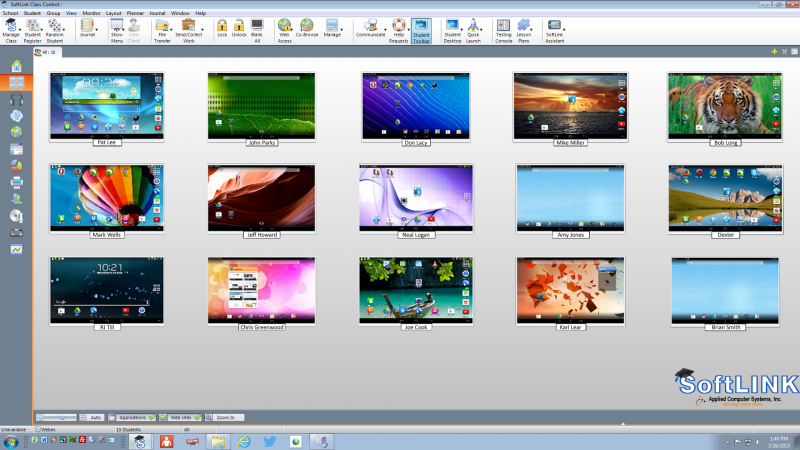 The teacher can view multiple trainee thumbnails on their Android tablet, zoom in on a specific trainee screen, show the teacher’s screen on all the student tablets for presentations, blank the trainee screens so he has their undivided attention, conduct a class survey and even share the results with the class. Before mobile devices were available and integrated into the classroom teachers were accustomed to teaching with desktops or laptops. Now with mobile devices and tablets becoming widely used in the educational world, it only makes sense for SoftLINK to be a key component in your technology plan. Whether you are equipping a new classroom or upgrading an existing computer lab you will want to peruse SoftLINK’s features. SoftLINK can even help reduce your overall budget. SoftLINK provides many key resources to involve, motivate, and engage your students. Remember the survey clickers? SoftLINK is a great replacement for the clicker since it has the instant survey feature already built-in. Are you tired of spending money on overhead projectors that may seldom be used or that are left on all-too-often, requiring you to replace costly bulbs? Use SoftLINK’s Show functionality to broadcast your instructional material directly to the students’ tablets! Learn about all of SoftLINK’s functionality and explore other ways that SoftLINK can replace a variety of teaching tools in your classroom. Instantly know what your students know. SoftLINK also provides an intuitive question and answer module. Deliver questions verbally to the class and use different questioning styles to gauge student understanding at any point during a lesson. Students can be randomly selected by “pot luck”, by “first to answer”, or by “teams”. Bounce questions to multiple students, ask the class to access a selected response, plus keep individual and team scores. What a great tool for class assessment. Engage your students and make learning fun. Beyond SoftLINK’s instructional benefits, SoftLINK extends its flagship of controls to tablet management features such as file transfer, block FTP access and WiFi/battery indicators. Instructors can quickly move documents between their desktop and the students using the intuitive file transfer feature. It is important for instructors to know how much battery life is left on their student tablets. No teacher wants to be in the middle of a lesson only to learn a student’s tablet is dead. SoftLINK eliminates this worry with its battery indicator display. SoftLINK also displays the current status of wireless networks for all connected student tablets. It doesn’t get any better than this for those who teach with mobile devices, Chromebooks, laptops, or desktops. SoftLINK is an impressive mobile management software package that provides valuable features for a variety of mixed devices, all at a very affordable cost. Learn more about SoftLINK by visiting Applied Computer Systems, Inc. at www.acs-linksystems.com or contact sales@acs-linksystems.com for pricing or a demo.